Clark Construction Company is a family owned business, so we strive to treat everyone on and around our sites like family when it comes to ensuring their safety. We have developed some of the best safety procedures, practices, and programs in the industry as evidenced by our numerous safety awards. Safety is a top priority at Clark. Everything we do is built with safety at it’s core and it is key driver in how we conduct business. 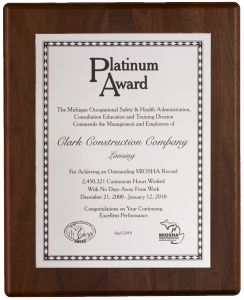 Clark is the recipient of numerous industry safety awards, most notably the 2017, 2015, and 2013 AGC of America Construction Safety Excellence Award and is the first construction company in Michigan to receive MIOSHA’s “CET Platinum Award” for more than nine years and 2.8 million work hours with no lost time injuries. Our Safety Program integrates management philosophies and action, quality, regulatory and monetary requirements, as well as meeting the ultimate objective of successful project completion. 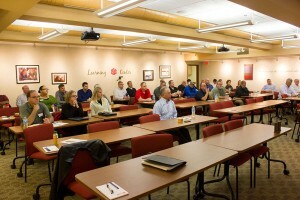 Clark’s Safety Program has had a significant impact on the reduction of trade contractor injuries and illnesses as well. The trade contractors that work on Clark projects have recordable incident rates 40% lower than the OSHA and MIOSHA industry averages. Clark has earned an impressive safety record. Our Experience Modification Rate (EMR) average over the last five years is .67, which is considerably lower than the industry standard of 1.0. That being said, safety is not about policies, procedures, or even awards. Ultimately, at it’s core, safety is about a personal commitment to caring about the people around us so that everyone is able to return home safe at night.